"I, being a citizen of this State, have not fought a duel with deadly weapons within this State nor out of it, nor have I sent or accepted a challenge to fight a duel with deadly weapons, nor have I acted as second in carrying a challenge, nor aided or assisted any person thus offending, so help me God." This strange promise, the product of an decades-long quest to stop the citizenry from dueling, is a reminder of a hard-won legal lesson. 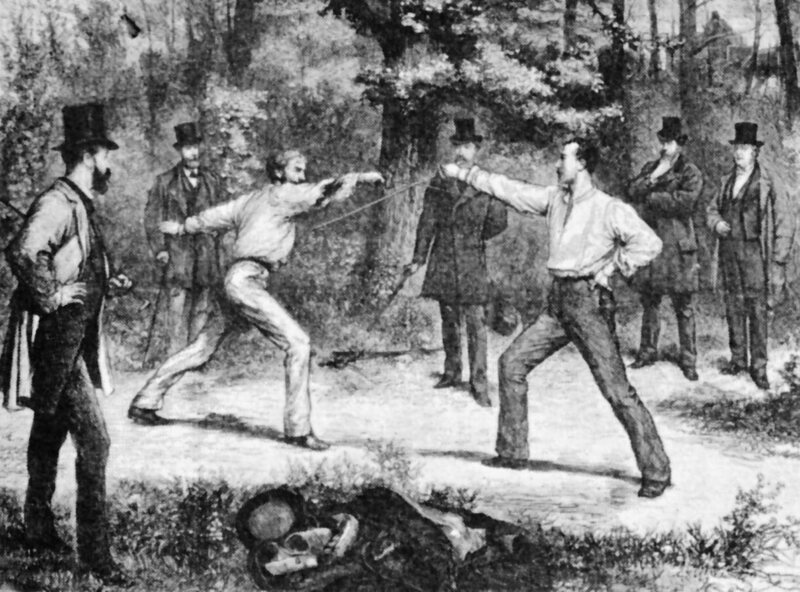 In order to convince their constituents to stop shooting each other over every breach in etiquette, 19th century Southern lawmakers had to find a way to overreach their legal authority: They had to turn dueling into social suicide. Today, taking up pistols over a small slight seems like a patently antisocial reaction. But in times past, as historian Jack K. Williams details in his 1980 exegesis of the practice, Dueling in the Old South, the people most likely to trade gunshots were those who wanted to elevate their status. Accepting a challenge from a social superior was a way to potentially climb up to his level. This speculative social benefit was why it was so difficult to get people to stop. The link between violence and honor has a long history: in one form or another, high-class dueling shows up in the Viking sagas, carved onto the pottery of Ancient Rome, and in at least one Egyptian epic. As cultures and weaponry changed over the centuries, duel customs constantly shifted to keep up. 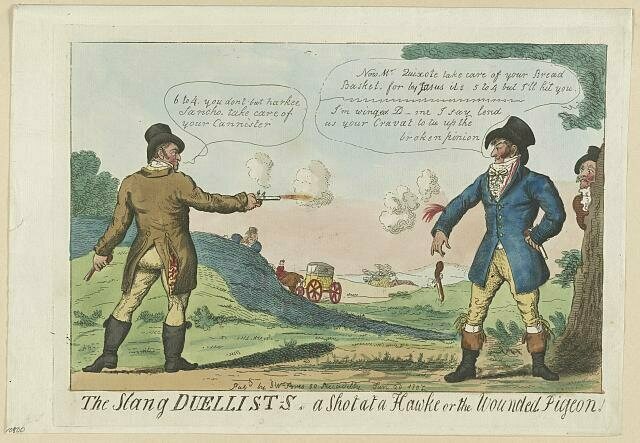 These rules remained largely unwritten until 1777, when a group of Irish gentlemen, tired of people playing loosey-goosey with pistols, put together a set of guidelines they called the "Code Duello." Its 25 rules, which instructed participants in a complex choreography of apologies, blows, and gunshots, set the tone for future fights in Europe. They also introduced yet more formality to the proceedings, upping its prestigious reputation. Early New World settlers had made do without the Code Duello—Massachusetts colonists fought the first recorded American duel in 1621, just a year after the Mayflower landed. But in the late 1700s, as new generations of Europeans headed to America, they brought the rules with them, and turned the newly codified practice into a bonafide fad. As Williams writes, "duels between gentlemen were recorded in New York, Illinois, Pennsylvania, Massachusetts, and elsewhere." Because it could so easily morph into socially acceptable murder, many states passed anti-dueling legislation early on. This alone failed to stop many dedicated duelers—Aaron Burr and Alexander Hamilton held their famed bout in New Jersey to sidestep New York laws. But as duels grew bloodier and more common, and an American national identity began to take shape, the practice gained a fair share of prominent detractors. "How can such miserable Sinners as we are entertain so much Pride, as to conceit that every Offence against our imagined Honour merits Death?" Benjamin Franklin wrote in 1784. There was one place dueling wouldn't give up its hold, though. Even after it had all but disappeared from the rest of the country, dueling remained "epidemic" in the South, writes Williams. Southern newspapers of the time are rife with matter-of-fact duel announcements, with headings like "Unhappy Transaction" or "Dastardly Assassination," depending on the writer's view of the outcome. One South Carolina editor covered a trio of duels in Camden in one week in 1817, and a visitor to New Orleans reported that in 1834, the city saw "more duels then there are days in the year." Duel-hating Southerners did their darnedest to stem the tide. As the 19th century progressed, more and more states banned dueling, and politicians, newspaper editors and religious leaders used their platforms to speak out against it (one minister, Mason Locke Weems, even wrote a tract called God's Revenge Against Duelling). Concerned citizens formed full-on anti-dueling associations, pledging non-participation and attempting to forestall what they called "fashionable murders" by writing diplomatic letters to the parties involved. Yet still, the sentiment against the practice refused to take hold in the South, Williams writes: "Public opinion generally refused to regard duelists as criminals." According to an account by British visitor Harriet Martineau, New Orleans's anti-dueling society apparently folded after a group of disagreeing members couldn't keep their pistols holstered during a meeting. Flummoxed, lawmakers tried a new tack. Rather than simply outlaw the practice, they appealed to certain gentlemen's ladder-climbing natures by making it illegal for anyone caught dueling to hold public office. From then on, if a rivalrous chap had his eye on City Hall, he knew he had to keep his pistol under wraps. As Lawrence Lessig writes in his 1995 work "The Regulation of Meaning," this may have changed the conversation. Before these ordinances, refusing a challenge was a double-bind—if you said you didn't want to duel, you were a coward; if you pointed out that it was against the law, and you didn't want to go to jail, you were still a coward. After the ban against duelers holding public office went into effect, however, it was possible to read things differently: you could bow out by asserting that your obligation to serve the state outweighed your own honor, and this would be an honorable exit. According to both Lessig and Williams, these rules were also ignored for a while—judges kept pushing their effective dates forward in order to avoid disappointing their friends, or infringing upon what they saw as an individual's right to defend his honor. It took the Civil War, with its major overhaul of class considerations, to convince people in positions of power to actually uphold duel-related statutes. 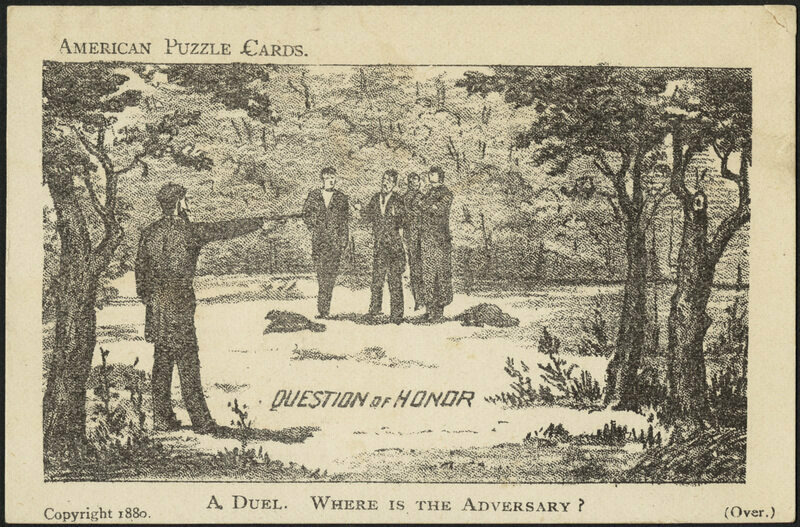 The last arrest-free duel attempt in the historical record belongs to two young lawyers from Savannah, who met up to fight in 1877 and, after hemming and hawing over the dusk and their mutual nearsightedness, decided not to go ahead with it after all. "The unwritten law gave way to the written," Williams writes, "and the code of honor died a less than honorable death." 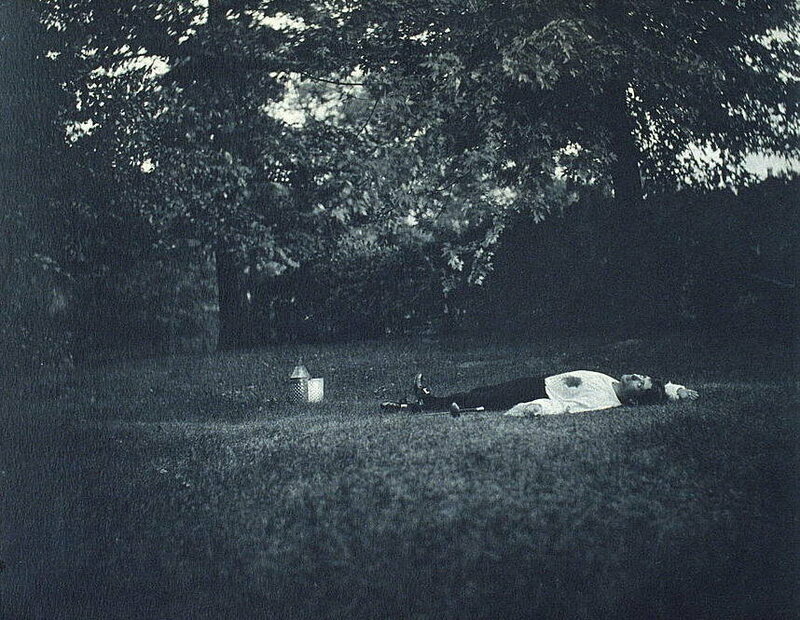 Like any good fighter, though, the duel has left a lasting mark. Attempts to remove the dueling ban from Kentucky's oath of office have thus far proven unsuccessful. Some of those who have taken the oath find it embarrassing, saying "it perpetuates that image of Kentucky as being backward." But there are ways in which it actually throws the state's progress into relief: No one has come to blows over it.